Try something different for breakfast. Halve and stone the plums and put in a small saucepan with 1 tablespoon of the honey, cinnamon stick and water. Cover and heat very gently for about 5 minutes until the plums are soft but not falling apart. Beat the remaining honey with the eggs and milk. Put the bread slices in a single layer on a dinner plate. Pour the egg mixture over the bread and leave to stand for 10 minutes until absorbed. Heat the oil in a large frying pan, preferably non-stick. Halve or quarter the bread slices diagonally and add to the pan. Fry gently for 1-2 minutes on each side until golden. Drain to serving plates and sprinkle with the sugar. 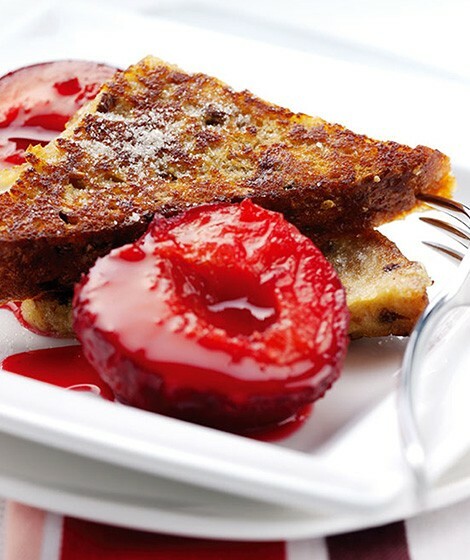 Serve with the plum compote. Variation - use fresh apricots or apples instead of the plums. "This was simple and really tasty, nice Sunday brunch." "Awwww thanks for taking the time to let us know! Glad you liked it :-)"